Effigies of Napoleon became more common after the successes of his first Italian campaign. The meeting between the sculptor Charles-Louis Corbet and the young general can be dated with certainty to sometime between 5 December, 1797 – the day Bonaparte returned to Paris – and 4 May, 1798 – the day he left for Egypt. This meeting was organised with a view to sculpting a full-size bust of Bonaparte, commissioned by the Directory. The plaster cast went on display at the Salon of Year VI (opened on 17 July, 1798) with the title Portrait of General Buonaparte, done from life, with the added note that it was to be eventually produced in marble form for the Directory. And so, at the Salon of 1800, Corbet presented General Bonaparte, marble bust, executed on the orders of the Directory during the Egyptian campaign. Although these two versions appear to have been lost, other plaster copies, signed and dated between Year VI and Year VIII (September 1797 to September 1800), can be found in collections belonging to, amongst others, Malmaison, Versailles, the Musée Carnvalet, the Musée de l’Armée, the Musée des Beaux-Arts de Lille, and the Musée Masséna in Nice. 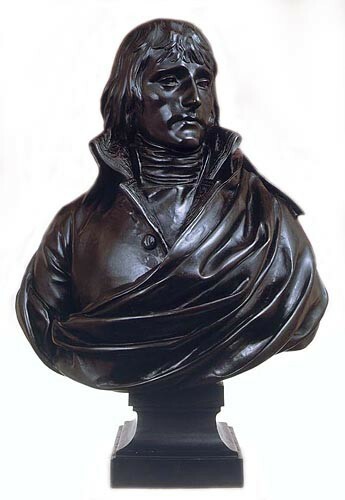 The bust was well received from the beginning, and the nineteenth century was to prove particularly favourable to it. Marble copies, produced by Iselin and Oliva, appeared during the Second Empire, and bronze casts – of varying sizes and intended for commercial purposes – were also smelted. The version that sits in the Fondation Napoléon collection belongs to this second category. One of the earliest sculpted portraits of Napoleon – along with those produced by Ceracchi and Boizot – this bust is superior to them all. Bonaparte is depicted in his general’s uniform and face on, with the head turned slightly to the left. The treatment of the general’s overcoat – thrown with no little panache over the left-shoulder – is straight out of the great traditions of ceremonial sculpture. Bonaparte’s appearance is in keeping with the style of the period: a thin face – almost emaciated – with hollow cheeks, prominent chin, and long hair, tied back at the neck with a fringe hanging down around the temples and across the front. In this bust, Corbet depicts the victorious conquerer of Italy confronted by his own dreams of glory. This celebration of France’s hero in the flower of youth exudes the same triumphant energy seen in other early depictions of Bonaparte produced by Gros and David (external link in French). It was however to be the last such example. In 1802, Corbet updated the portrait in accordance with the physical and political evolution that his model had undergone. The First Consul, from life, presented at the Salon that year, is subsequently little more than a tidied-up, official version, stripped of the epic spirit that makes the original bust what it is.